To add insult to injury, the direct Preston to Salford train which I had so casually dismissed was mocking me by running on time. Suitably dejected, I set off in search of the Gents, giving me a chance to see a bit of Bolton station. It appears to be in the middle of a refurbishment – it certainly looks much better than it did the last time I was there (in 2006), with a new extension to the platform canopies and the station freshly painted in Northern Rail corporate colours. 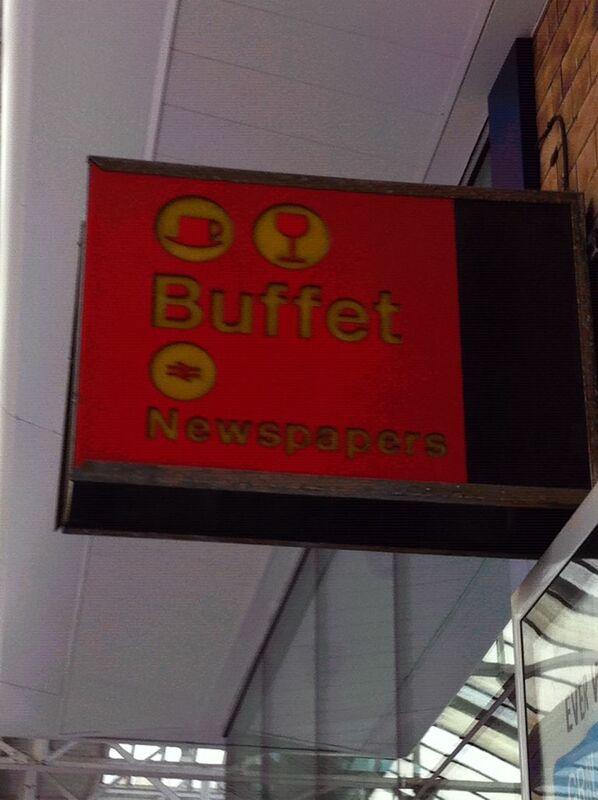 Despite the new look, this wonderful sign – with pictograms and colour scheme that scream “80s British Rail” – survives. I returned from the loo to discover that the Manchester Airport train had slipped a further few minutes. However, there was also a 1725 to Manchester Victoria which was now expected to arrive first. Under normal circumstances it would get me to Salford at 1738, with five minutes to spare. Unfortunately this train was also running four minutes late. It was going to be a photo-finish. The train arrived and, after sorting out a few confused passengers wondering where their Manchester Airport train had gone, we were off for the short journey from Bolton to Salford Crescent. We made good progress most of the way and I actually began to think that we would easily make it. I was thrilled when the train started to slow down well before its expected arrival time at Salford Crescent. Perhaps there was a few minutes slack in the timetable, or maybe our skilled driver had been able to make up time? Frustratingly, this was not the case – we were actually slowing to stop at a signal, and the train came to a halt just outside the station. The total wait was only about a minute, but those 60 seconds, to me, could have meant the difference between getting Clifton and missing it. We got going again and the train crawled agonisingly slowly into Salford Crescent station. There was a train on the opposite platform and instinctively I knew it was the one I needed. I also knew that the time was 1743 and it was ready to depart. After what seemed like an eternity, the door buttons lit up and I leapt out and straight across the platform. The train dispatcher was on the platform, just about to raise his paddle to give the right away signal to the guard. I didn’t even pause to check if it was my train, but a nanosecond glance at the electronic display on the platform enabled to pick out shapes that looked vaguely like “1743” and “Clifton (Manchester)”. I opened the nearest door and dived aboard. I slumped in a seat and tried to send a triumphant Tweet, but couldn’t – my hands were actually trembling, such was my anxiety about the situation. I had no time to pull myself together, however, as just five minutes later the guard announced the Clifton stop. I was, unsurprisingly, the only person to alight. After all that kerfuffle, Clifton station could only be an anticlimax. While Salwick had a certain rural tranquility to it, the same could certainly not be said for this slightly scruffy residential outpost of Salford. As expected, the station itself was bare with the only feature on each platform being a rudimentary shelter. 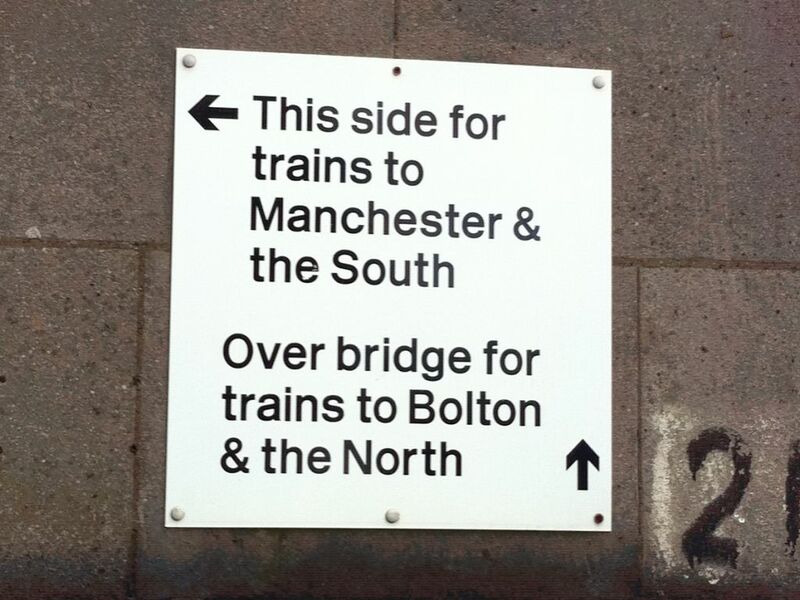 A sign on the road bridge told intending passengers where to go for “Trains to Manchester” and “Trains to Bolton”. To be more accurate it should read “Train”, singular, for Clifton station receives precisely one per day in each direction. There is a morning service at around 7am to Manchester and a return journey (the train I used) in the evening. In theory, these trains are quite well-timed for a commuter journey. In practice, however, I suspect few office workers would take the risk of missing the only train and being stranded. 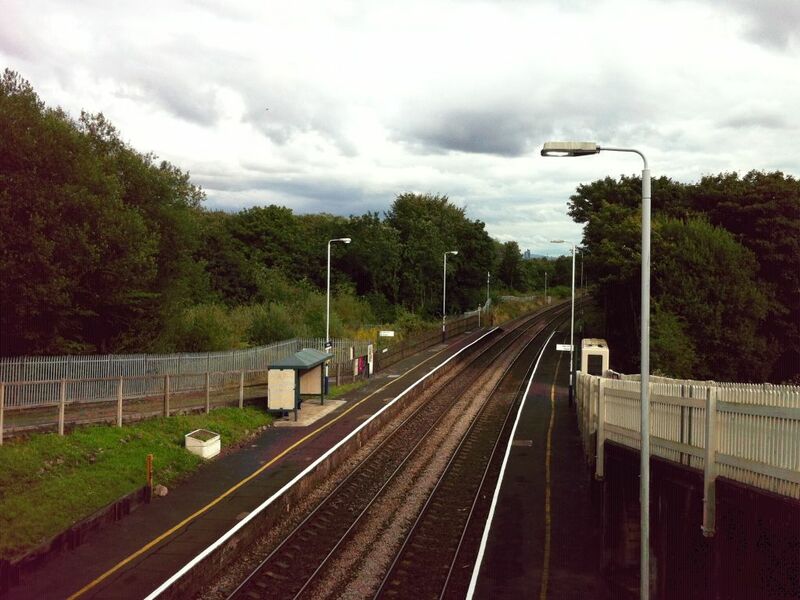 This is reflected in the usage figures – in the 2009/10 financial year just 278 people used this station. Again, I found myself questioning the reasons for the sparse service. The station itself is in a residential area, there are plenty of local trains passing through every few minutes. I would assume there is enough potential traffic to justify a more regular service. 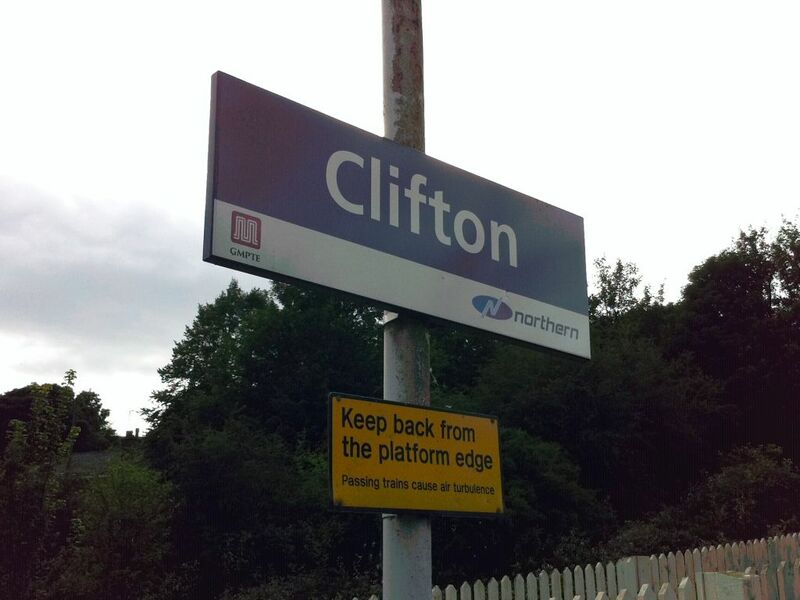 There was one small highlight – Clifton appears to have escaped the mass Transport for Greater Manchester rebranding exercise, and the roadside sign still proudly bears the original GMPTE logo in the hideous orange colour they used during the late 1980s. Look how pleased I am to be standing underneath it! So that was Clifton station. 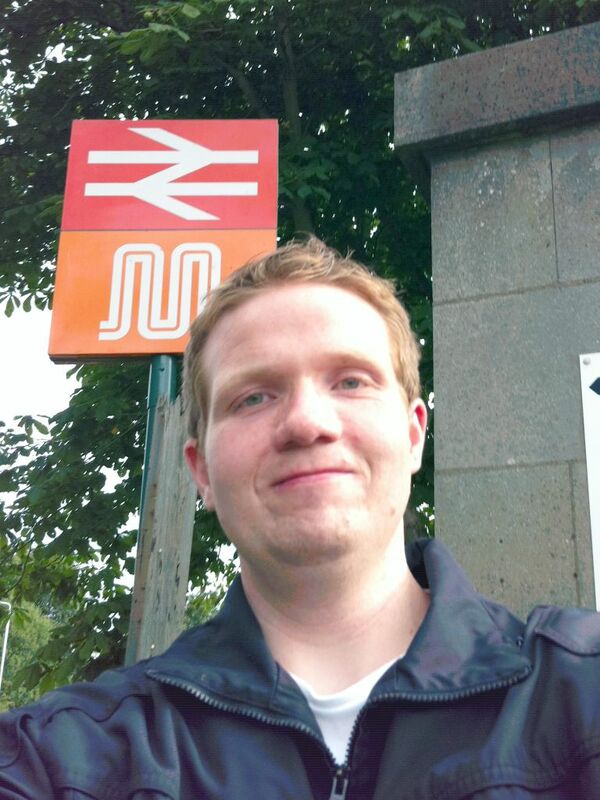 With no prospect of another train stopping here until tomorrow morning, I had to walk to Swinton, just over a mile away, from where I could get a train back to Manchester or, even better, to Kirkby for an onward connection to Liverpool. As I walked, I became aware of a small group of teenage boys on mountain bikes nearby. They were not overly aggressive, but my upbringing has taught me to treat anyone wearing a tracksuit and a baseball cap with suspicion. They pulled up alongside me. “Where’s the nearest shop to here, mate?” one asked. 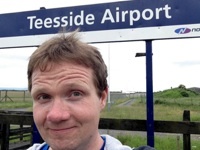 “Sorry, I don’t know,” I replied, truthfully, doing my best to hide my Scouse twang. I’m guessing they’re not used to tourists around there.